Hungarian born BLACK NAIL CABARET have gathered a wide audience inside and outside their homeland. Now a fully established darker synth act, Emese Illes-Arvai who partnered with Sophie Tarr in 2008, debuted with a surprising version of Rihanna’s ‘Umbrella’ to kick off their musical journey. 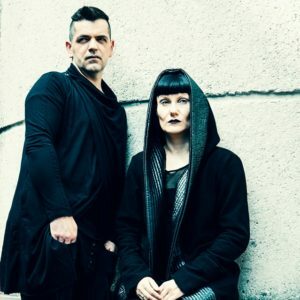 Their sound took electronica listeners by storm, mainly due to the eloquent use of hardware and interesting melodies, making BLACK NAIL CABARET very distinguished. Tarr left at the beginning of 2016, but Illes-Arvai continued writing to release the third opus, ‘Dichromat’ before Christmas, this time joined by Krisztian Arvai on keyboards and production. The Electricity Club is chatting to BLACK NAIL CABARET about their past, present and future with the news that they will be performing at London’s Electrowerkz on SATURDAY 6TH MAY 2017 as part of Synth Club. Your first proper outing was with Rihanna’s ‘Umbrella’. An interesting song to be covered by a synth band? Emese: I loved the chorus of the song and I was craving to do my own interpretation of it, to give it an 80’s synthpop feel. I was also testing my ability to put together a song from start to finish as that was one of my very first creations. It was a lot of fun. ‘Emerald City’ was your first album. With tracks like ‘Hangman’ and ‘Veronica’, you certainly made few heads turn. Did you expect that reaction? Emese: Not really, we were simply hoping for the best. Those were also experiments with sound, trying to find our way and niche and I wasn’t even sure whether the album will be coherent at all. Emerald City was a good lesson, but to be fair, all albums are lessons to some extent. Krisztian: Those were the first two songs I heard and those made my head turn too, this is when I came into the picture as a producer. ‘Satisfaction’ on your follow-up opus ‘Harry Me Marry Me Bury Me Bite Me’ showcased a big sonic leap into darker spheres? Emese: Definitely, which is due to Krisztian joining the songwriting process for Harry Me. We were listening to a wide range of stuff at that time, getting inspiration from new sources, which I believe comes across quite nicely. 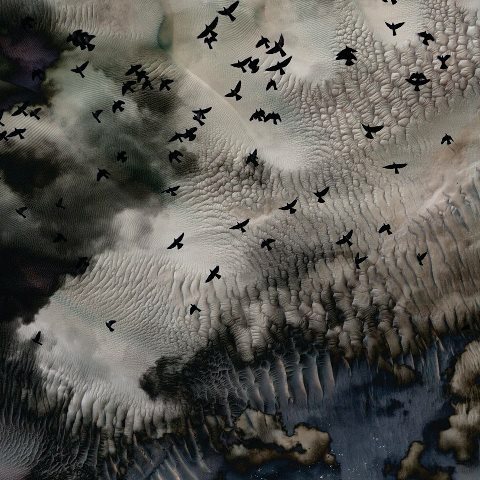 Krisztian: This was the first song with which I wanted to showcase the direction I thought BNC should move toward, without losing the general BNC mood. In other words, to push the borders. Not many newish acts get to support CAMOUFLAGE or COVENANT, how did that come about? Emese: We were at the right place in the right time I guess. We were lucky to support CAMOUFLAGE and COVENANT in Hungary thanks to a few enthusiastic and hands-on organisers who saw us performing before and thought we were a good match. The guys from Camouflage liked our show and invited us to their upcoming German tour to support them along with SOLAR FAKE. We had an amazing time! Releasing the ‘Steril’ EP in your native Hungarian was a brave step too? Emese: I’ve always played with the thought of writing a Hungarian song or songs, but I found that I sound way too pompous when singing in Hungarian. It requires a different kind of phrasing and it is easy to sound ridiculous. Since we have a great fan base in Hungary, but also loyal followers from many other countries, the time felt right for at least an EP on our mother tongue. I think I also matured enough to produce Hungarian songs without sounding awkward, at least for myself. Krisztian: I was intrigued by the task as I always wondered what BNC would sound like on our mother tongue. Emese: …and it helps me to transform into someone or something that is different from my normal self. It’s hard to name it and it is constantly changing from concert to concert. Emese, how was your collaboration with the master of production that is Daniel Myer? Emese: It was great fun, I got to do what I like to do the most: writing words and coming up with ideas for speech and/or vocals and playing with the structure. It was a truly inspiring process. Daniel then turned the songs inside out and I was amazed to hear the final versions which in many cases had nothing to do with the demo I worked with. There’s a mystic vibe when performing these pieces live. Emese: Haha, nice observation! We have lots of things to thank DEPECHE MODE for; friendships, music, our relationship and the list goes on. It is no secret that we’re coming from the synthpop/darkwave/goth subculture. However, there are many other great artists who have constant influence on our music. Krisztian had been involved with BNC prior to Sophie’s departure and now he’s a full time member. Why did Sophie leave such a successful project? 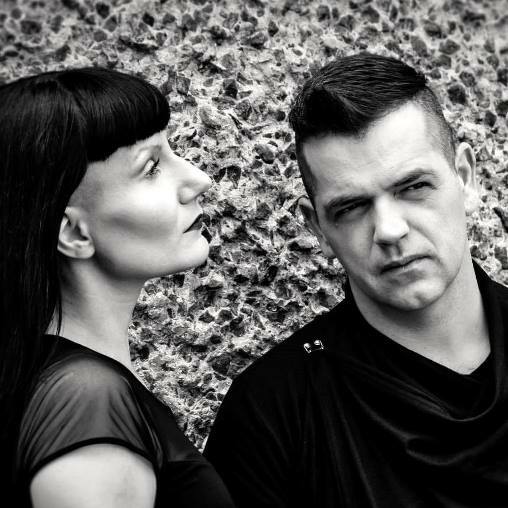 Emese: She felt that she could not be part of a dark synthpop kind of project any longer, and that her role had lost authenticity so to say. She has been into completely different kind of music for some time now – more guitar-oriented, experimental stuff. I respect her for that, for standing up for herself in that way. I think this is probably the best for the both of us, as now I can play with my weird dark characters on stage freely. It is also no secret that she is going to be a mommy soon. Has moving to London opened any new doors for the band? Emese: Well, we got to know amazing people and artists here in the UK. It’s a new wave of inspiration, also in the multicultural sense. I don’t think we’d ever be played on a British internet radio show if we were still living in Hungary. Krisztian: It is also worth mentioning that it became easier to develop our technical background and gear, which is essential with such band activity. This has been a huge help for live shows as well as for studio work. Nevertheless, we get less bookings in Europe as it is hard to travel with the full stage setup. Emese: I love the mechanical sounding of the word. The songs are dichromatic imprints of reality – I tend to say. All that I perceive from reality comes through my own filter, and goes into the music and lyrics. It always lacks a colour from the whole picture, because it is my own experience, which I put down in words and melodies. The listeners will add the extra colour; their own interpretation. Your use of analogue shines throughout the latest production, and that, coupled with Emese’s vintage vocal, adds to a synth success story! Emese: Thank you very much! It comes across quite clearly that we have more hardware now than before, and we use them as much as possible. Krisztian: It is important to improve and learn from others. You can get away with only using software synths but in the end you will find that the raw sound of analog synths makes the production work much easier and enjoyable. ‘Minor Panics’ proved to be the most popular song from the opus, did you think that’d be the case? Emese: To be honest, no. We both had our own favourites from the album, but for me it wasn’t Minor Panics. It’s an honest, sentimental song, it might be a little awkward to admit that I got emotional during the chorus so I had to stop recording for like 20 minutes because my voice became too shaky. Not sure if that contributed to its success. Krisztian: We didn’t pay much attention to write a particularly popular song to the album, we only felt that it’s going to be a strong material altogether. ‘We Like To Suffer’ is accompanied by a monochromatic video with a masochistic existence in mind; nothing ever ends well in the works of BNC? Emese: I try very hard here to come up with an objection, but I can’t. No, seems like nothing ends nicely. The bare fact that all the inspiration comes from frustration explains how BNC is functioning. I find it hard to write songs about happiness as I rather just enjoy it when it occurs. Frustration on the other hand wants to be written out, this is how I deal with it. You play at Synth Club in London in May. What have you planned for that? Emese: This is going to be our belated UK ‘Dichromat’ launch gig, so we plan to play as many new songs as possible! Are you planning to gig ‘Dichromat’ outside the UK and your native Hungary? 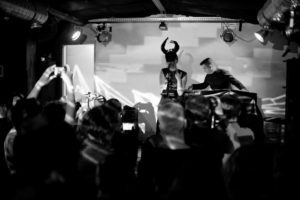 Emese: We already did an album launch in Budapest, and we have a few shows booked in Prague, Leipzig (Wave Gotik Treffen) and some further gigs in Hungary and Switzerland (Eine Nacht im Bergwerk Festival) in the second half of the year. We are always on the lookout for new cities and dates, so promoters are welcome to get in touch!